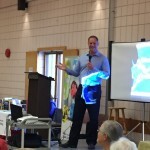 Dr. DiGiuseppe doing a talk at the 55 Plus Centre. In an effort to encourage and promote healthy lifestyles, our office provides ongoing educational workshops and presentations on a variety of topics. Dr. James has done well over 300 presentations to several groups including: schools, places of work, industry, municipal branches, local community organizations and clubs, and in office to his own patients. We encourage you to consider having Dr. DiGiuseppe present or workshop with your group or organization.